Is your previously outgoing dog suddenly cowering or afraid of certain sounds? 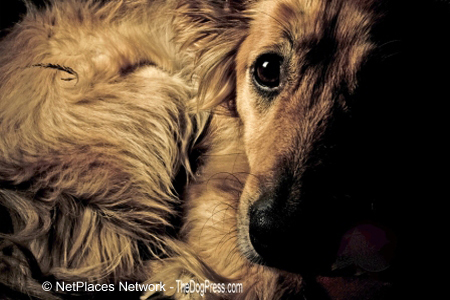 Was your pet ever traumatized by an extremely bad experience he can't seem to forget? "He has seen it all." This Veteran's Day reminded me of all the soldiers suffering from PTSD and not getting near enough help. I've got a buddy like that. We stay in touch but since his medical discharge, he goes for long spells with no contact. He's a pretty regular guy but his mind hasn't healed as well as his back did. I mentioned it to my daughter and typical, she turned it right to dogs. We talked a little and then she said "Hang on dad, I want to show you something you should write about." In a nothing flat she was back with a canine PTSD printout from Veterinary Practice News. It described a "relatively secure though sensitive dog that evolved into an extremely anxious and hyper-vigilant dog." 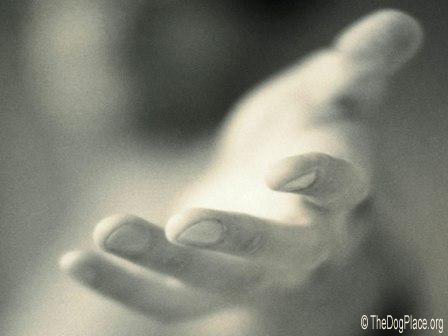 She pointed to "It was almost as if he expected something bad to happen again at any moment." then she bounced off to make coffee, left me with my thoughts. I finished reading the post traumatic stress article. Okay, I'll buy it. I never worked with K9s but if PTSD gets to soldiers, why not dogs. They say if your dog was previously happy and confident but starts being fearful or has a personality change like my friend, you can be sure that something happened to trigger the jitters. I thought of Rob. With him it was pretty damn obvious what ruptured his mind. He couldn't move and was under fire! It took the medics a while to get to him so yeah, that was pretty "traumatic". You may have to rewind your mind to recall what happened to your dog that triggered his anxiety. We've all seen a dog react instantly to a sudden incident like a pile of boxes falling on him. Usually they get right over it but what if he got hit by a car? Or some idiot thought it would be fun to throw a firecracker at him? One family my daughter knows has a longhaired dog, always outgoing and well, yappy. Last July they had a visit from an old friend. They had a few drinks and the friend had more than a few. No one actually saw anything happen but the guy was too drunk to drive so he spent the night. The next morning, the dog was in hiding and even after the guy left, she had to be coaxed to come out. Weeks later, she was still spooky so my kid sent them a link about dog training and behavioral consultants (see below) and they found a husband-wife team here locally. The trainers decided the wife would need to be the one working with the dog, I guess because it was the man that spooked her. Anyway, the "re-conditioning" sounds a lot like what they do with traumatized soldiers and it is already working with their dog. The trainers explained to them that normally, if it has had a trauma-injury, a dog's body and mind will quickly recover. But like people, I guess each dog is an individual. Rob was a pretty solid guy until he got hit. So here's my takeaway. If your dog has developed what they call canine PTSD, think back and see if you can recall an incident that recently happened, like a severe electrical shock, being hit by a car, or maybe it got beat up by another dog. The article said that repeated abuse can cause a dog to cower and do submissive urination. That's an involuntary release of urine due to fear. I saw a grown man do that but it was when a grenade went off during a squad meeting. We all laughed and made light of it but uh, that was after we reassembled. The article said submissive urination in dogs is caused by abuse and chronic fear. But what the hell! If your dog has been regularly abused, you are unlikely to be concerned about canine PTSD and even less likely to be reading this. One last thing, I want to thank TheDogPlace for covering Veterans Day (see below). Whoever that Joe guy is, he is to be commended for trying to do something for K9s. I had a couple of buddies in 'Nam whose lives were saved by those dogs. I want you to watch this video my Seal buddy sent. I had to go find it again (click the VIDEO Dog), amazing how much was out there about war dogs and police dogs too. The water work video is what I want you to see. Its a tactical drill showing a climb that military dog handlers do and it takes strength, guts, and determination. I groaned as I listened to his struggle but what you guys will notice is the fearless, totally limp dog. How can they train a dog to be that completely still? Damn! I watched the video about the shelter dogs that save Veterans affected by PTSD. Then there's the one about Icar that's shipped home to his former handler. What do you think. Will the dog remember him? Veterans battle for support-therapy dogs with $20K price tags. 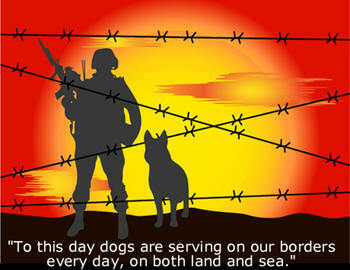 This site has supported K9 Veterans since 2009. Do YOU? A real Dog Whisperer can solve your family dog problems.